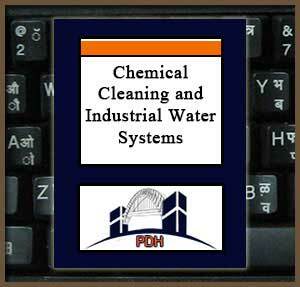 This course will introduce you to methods for cleaning industrial water systems with chemicals. You will learn about pre-operational cleaning which is performed to prepare water-contacted metal surfaces to receive chemical treatment to provide protection from scale, corrosion and microbiological growth. You will also learn about remedial cleaning to restore water systems that have been fouled with scale, corrosion products and microbiological growth due to inadequate or ineffective water treatment. Examples of industrial water systems for which chemical cleaning are applicable are boilers, heat exchangers, cooling towers, and chillers. Maintenance of an effective water treatment program is essential to minimize scale and corrosion problems in industrial water systems; however, scale and deposits will often form and require remedial cleaning. If not removed, these scale and water-caused deposits may impact the safety of operations personnel, interfere with heat transfer, and cause excessive damage to, or destruction of, the water-using equipment. This course is intended for mechanical engineers, civil engineers, mechanical maintenance technicians and construction professionals and technicians wanting an introduction to the use of chemicals for cleaning industrial water systems and equipment such as boilers, heat exchangers, cooling towers and chillers. Learn about pre-operational cleaning of new industrial water-using systems and equipment. Learn about remedial cleaning of industrial water systems and equipment to restore them to optimal operating condition. Learn about chemical cleaning methods that have largely superseded mechanical cleaning methods. Learn about chemicals used for chemical treatment of industrial water systems.